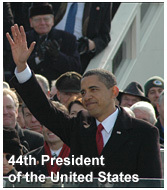 This site is one of the Democracy in Action sites documenting recent presidential campaigns: P2012 | P2008 | P2004 | P2000. It can be accessed at "http://www.P2008.org" or "http://www.gwu.edu/~action/P2008.html"
Overview: In 2008 there were open races for both parties' presidential nominations. For the first time since 1952 a sitting president or vice president was not a candidate for nomination of either major party. What transpired was the most costly ($2.4 billion according to the Center for Responsive Politics) and seemingly the longest presidential campaign in American history. Sen. John McCain (R-AZ) rebounded from near implosion of his campaign to emerge as the Republican nominee. On the Democratic side, after a lengthy primary battle, Sen. Barack Obama (D-IL) outmaneuvered Sen. Hillary Rodham Clinton (D-NY), who had early on been seen as the frontrunner. Benefitting from President George W. Bush's unpopularity, a huge fundraising advantage, and an unprecendented field organization, Obama garnered 69.5 million votes (52.9%) to 59.9 million (45.7%) for McCain, carrying 28 states and DC, and winning 365 electoral votes to 173 for McCain (+). In addition to reclaiming the White House, Democrats also control both houses of Congress. Republicans, meanwhile, face a period of rebuilding.